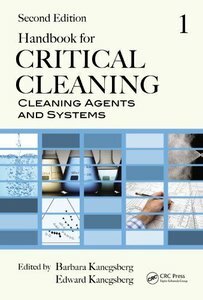 Barbara Kanegsberg, Ed Kanegsberg, "Handbook for Critical Cleaning: Cleaning Agents and Systems, Second Edition"
Cleaning Agents and Systems is the first volume in the Handbook for Critical Cleaning, Second Edition. A decade after the bestselling original, the Handbook for Critical Cleaning, Second Edition helps manufacturers meet today’s challenges, providing practical information and perspective about cleaning chemistries, equipment, processes, and applications. With 90% new or revised chapters plus supplementary online material, the handbook has grown into two comprehensive volumes: Cleaning Agents and Systems and Applications, Processes, and Controls. The first volume, Handbook for Critical Cleaning: Cleaning Agents and Systems, gives manufacturers a practical understanding of the variety and functions of cleaning chemistries and cleaning, rinsing, and drying equipment. Topics include aqueous, solvent, and "non-chemical" approaches. Readers can compare process costs, performance, and regulatory issues, and then choose their best option.